Awful stuff, bought 12 for £7 about 6 months ago and still have some left. Flamedeer don't drink this. That's a fact. The Flaming deer drink anything. That was used b4. Stripey. This stuff is awful tasting. Just compare it with a bottle from a six pack you can buy in a normal off-licence - no contest. It's cheap rubbish. Iwas in spasda the other day and noticed smart price beer and lager a pound (£1) for 4 cans!... was gonna get some of the beer for a shandy but the missus said 'you dare'! LOL... I wouldn't mind we're as common as muck! This stuff is awful tasting. Just compare it with a bottle from a six … This stuff is awful tasting. Just compare it with a bottle from a six pack you can buy in a normal off-licence - no contest. It's cheap rubbish. I didn't think they would change the product for the smaller pack sizes? Why would they do that? I didn't think they would change the product for the smaller pack sizes? … I didn't think they would change the product for the smaller pack sizes? Why would they do that? 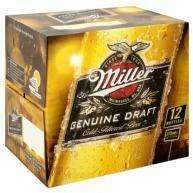 I've tried this a good few times before but it just does not compare to the miller you get in off-licences - not just the 6 packs but even the 12 packs which aren't completely square like this box. Just buy a box of this stuff from asda and a box/pack from a off-licence and you'll taste the difference easily. A few of my friends who drink miller think the exact same. I've tried this a good few times before but it just does not compare to … I've tried this a good few times before but it just does not compare to the miller you get in off-licences - not just the 6 packs but even the 12 packs which aren't completely square like this box. Just buy a box of this stuff from asda and a box/pack from a off-licence and you'll taste the difference easily. A few of my friends who drink miller think the exact same. Not about liking it, I do too. This is SCOTLAND only 20 pack not available in England! absolute rubbish as a miller fanatic as I am who has tried all 3 sizes 275ml 330ml and 500ml cans (only available in Scotland and NI) there is absolutely no difference between the 275ml and the 330ml bottles. The only difference is in the 500ml cans which are 4.3 abv originally meant for the Irish Market but has recently gone on sale in Scotland due to the high sales of MGD in that country.